This spectacular musical is the truly inspiring story of small-town girl, Peggy Sawyer and her meteoric rise from chorus line to Broadway star. Based on the original film starring Ruby Keeler, this feel good show boasts the immortal numbers, ?We?re in the money?, ?The Lullaby of Broadway?, ?Keep young and beautiful? and the spectacular title number ?42nd Street?. It?s not all plain sailing for Peggy, who has to contend with the fiery director Julian Marsh, but as Julian reminds his prot?g? before the opening night- ?You are going out there a girl, but you are coming back a star!?? This show has won many accolades over the years, so whether it?s your first time or umpteenth time- ?come and meet those dancing feet, on the avenue I?m taking you to- 42nd Street!? DUE TO TECHNICAL DIFFICULTIES, OUR?MATINEE ON THE ?6th JUNE HAS BEEN CANCELLED – ALL ?OTHER PERFORMANCES FOR THIS PRODUCTION ARE NOT AFFECTED BY THIS ANNOUNCEMENT. by?Rick Bowen?-?ALTRINCHAM Garrick's 42nd Street is an amateur production in name alone, performed by a company that was simply born to sing and dance. ?Even on a miserable Monday masquerading as the first day of summer, it left the audience with that floating on air feeling, this absorbing and warmly funny tale of a chorus girl whose simply a star in waiting. ?Under the inspired direction of executive producer Paul Kerryson this show simply couldn't fail. Garrick members must have been rubbing their hands when he agreed to join the theatre and he particularly excels when it comes to musicals, bringing the best out of a cast who give the distinct impression they don't want to leave the stage. ?The dance routines are slick, stylish and sensual and for this I must praise choreographer Deborah Norris for bringing us some sensational tap numbers. It feels like magic is coasting through the feet of the dancers, who make it look oh so easy. ?Megan-Hollie Robertson makes a perfect Peggy Sawyer, battling against the fading star Dorothy Brock as she dreams of stardom. As the diva like Brock, Vicki Clarkson has a terrific voice and both wouldn't sound out of place on a professional stage. Then there's the ever watchable Charlie Tomlinson as the demanding director Julian Marsh. Not so much a tough taskmaster, more the tough taskmaster's more demanding twin brother. ?Add some classic showstoppers like Lullaby of Broadway and You're In The Money, and you have the complete musical package. So, why were there some empty seats on Monday night? Productions as brilliant as this should have people beating down the box office door. 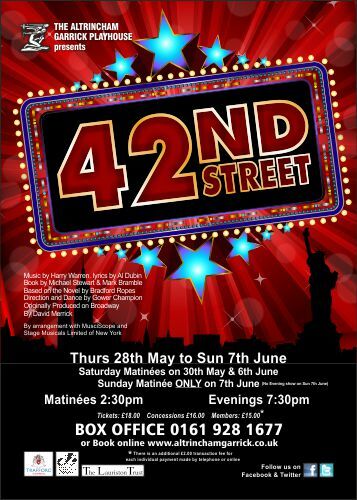 The best musical I've ever seen in Trafford by a street, a 42nd Street. ?As always, the Garrick breaks up for the summer with a show to remember. This time, it?s the happy, tapping 42nd Street with Al Dubin?s lyrics and Harry Warren?s music. It rattles along with a live, on stage band led by Simon Murray and a troop of well-choreographed dancers. The show keeps you on a high throughout. ?It amazes me how the Garrick, can with apparent ease, find ten lively, competent, people who don?t just dance but sing simultaneously. ?And what wonderful songs they sing. Songs which never date such as We?re in the Money, Shuffle off to Buffalo and Lullaby of Broadway are just a few, not to mention the show stopping title song. ?The thin plot centres on chorus girl Peggy Sawyer who steps into the breach when ageing star Dorothy Brock breaks an ankle in Pretty Lady, the show within the show that must go on at all costs. ?Megan-Hollie Robertson is well cast as the lively, light-hearted Peggy, the girl whose dreams come true. ?The other leading lady, Vicki Clarkson?s Dorothy has no more dreams to dream. Her show-biz career is over. Clarkson takes us through her descending journey. Her rendering of I only have Eyes for You is tear jerking and indicates that love is more important than success. She proves it by marrying her true love, Pat Denning (Richard Ross). ?The task of keeping Pretty Lady on the road falls to dynamic Charlie Tomlinson as Julian Marsh, its director. His main aim is ?The show must go on? and he becomes frustrated when this aim is in doubt. His singing of 42nd Street is delightful. ?Director Paul Kerryson?s professional touch proves to be a winning one. ?With Mike Shaw?s imaginative costume design, this happy production is one to remember. by?Rick Bowen -?THEY don't write 'em like this anymore. ?A musical classic brings the curtain down on Altrincham Garrick's current season, a show so stuffed with showstoppers it's impossible to find a weak number among them. ?Director Paul Kerryson is in no doubt as to what makes 42nd Street such a special piece of theatre. ?Paul said: "The words 'feel good' are often used to describe a musical comedy, but in this case it's really true. Based on the iconic 1933 film of the same title, this musical captures all the glamour and spectacle of the 1930s. ?It also can claim the fact that every song is a hit and of course contains all the excitement of tap dancing and jazzy numbers. 42nd Street has a great moral too- with talent, hard work and a little luck, you really can get to the top. "?His favourite songs include what he describes as the "famous" Lullaby of Broadway, which is sure to have even the incurably miserable tapping their feet in time to the infectious music. ?He said: "But I also really like the lesser known, Getting Out of Town, where the dancing company leave New York with their suitcases, and travel by train to Philadelphia. In our production, the huge live dance band are also revealed on stage during this travelling number. "?The show, as well as having a fabulous score, also has some BIG dance numbers. What sort of challenges does this pose for the production team? ?He said: "The choreographer certainly has a challenge with this. The young company really need to have the so called "triple threat"- being able to tap, sing and act brilliantly. Manchester has a huge supple of talented young people, and we are thrilled to have some of them in this Garrick production."